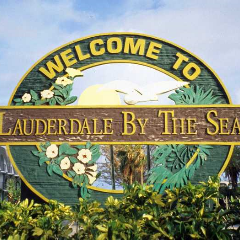 The Town of Lauderdale-By-The-Sea is home to warm tropical breezes, spectacular ocean views, quaint downtown shops, a pier that extends 876 feet over the ocean, a unique snorkel trail and a coral reef with colorful fish, spiny lobsters, and other marine life – all within 100 yards of the beach! Because the reefs are popular with beach divers, the Broward County Commission in 1997 declared the Town the Shore Diving Capital of Florida. The Florida Division of Historical Resources in June, 1994, also designed the underwater remains of the SS Copenhagen, a 19th century steamer that sank offshore in 1900, as an official underwater archaeological preserve – one of only 10 such preserves in Florida. The town isn’t far from the Everglades, the Florida Keys, and everything else South Florida has to offer. Take a swim, snorkel over a beautiful reef, drop a baited hook in the water from Anglins Pier or just take a quiet stroll along the shore to collect sea shells. With a number of fine local restaurants, specialty stores and boutiques within walking distance of your hotel, there is plenty to do and enjoy in the Town of Lauderdale-By-The-Sea, even if you decide to kick back, relax and never leave the beautiful beach!